KUALA LUMPUR (Nov 21): Share prices are mostly lower on Bursa Malaysia today amidst lack of buying impetus, while sentiment on the major sectors such as oil & gas, plantation and property has turned cautious. The FBM KLCI ended the week on a negative note. The benchmark index dropped 13.16 points or 0.72% to 1,809.13 points, giving up all the gains made during the past week. Week-on-week, the index lost 4.66 points or 0.26%, after it has hovered in the range of 1,805 points to 1,825 points throughout the week. Across the board, some 1.77 billion shares worth RM1.66 billion were traded. Market sentiment maintained bearish, with decliners outnumbering gainers at 464 versus 295, while 464 counters were unchanged. Benny Lee, chief market strategist for Jupiter Securities Sdn Bhd, said the FBM KLCI was mainly dragged down by the fall in the share prices of Petronas Dagangan Bhd and CIMB Group Holdings Bhd. “Petronas Dagangan fell by about 4%, while CIMB was down by about 2%. 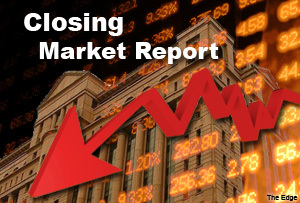 These counters were the main cause for the fall in the market today,” he told theedgemarkets.com. Looking ahead, Lee expects the bearish tone to persist with a support level of 1,800. The top loser was Petronas Dagangan Bhd, while Carlsberg Brewery Malaysia Bhd led the top gainers. Nova MSC Bhd was the most actively-traded stock of the day. Markets across the Asian region were mostly up, with Japan’s Nikkei gaining 0.33%, South Korea’s Kospi rising 0.35%, while Hong Kong’s Hang Seng closed 0.37% higher. According to Reuters, Asian shares rose on Friday, after the latest statistics showed broad US economic strength; while the yen rebounded from overnight multi-year lows, after Japan's finance minister warned that its recent weakening had been "too rapid". MSCI's broadest index of Asia-Pacific shares outside Japan was up about 0.3%, though on track for a weekly loss of over 1%.